The process of researching and purchasing a swim spa can be overwhelming. There are a lot of products on the market. A consumer has a big task simply in learning to tell the difference between the good companies, the great companies and the companies to avoid. The price of a spa means something, but the value of a spa, the reputation of the company and the trust you have in your salesperson are all far more important factors than the price tag on the spa. The better your relationship with your salesperson, the higher your spa value will be and the more money they will save you by managing the process professionally and ethically for you. 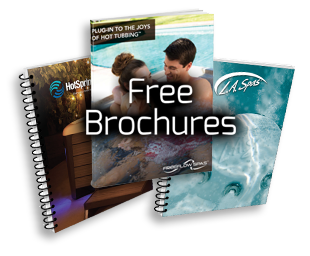 Swim spas are available in different types of swim currents, features, model sizes, and price ranges. We work with most of our customers between one month to a year prior to delivery, assisting over the phone and in email with answering questions and providing pricing, assisting in person in our showroom for swim test visits, visiting homes for yard and pre-delivery walkthroughs, providing quotes, qualifying for financing, placing orders and taking their down payments 4-6 weeks before delivery, and scheduling & coordinating delivery with contractors prior to and on the day of delivery. Fill out one of the forms on our website or give us a call and let us know you’d like more information. You will receive a phone call and email the next day with brochures and information. We’ll send you some emails with helpful details and tips. You call to ask questions and get pricing ballparks on certain models. Pertinent information is emailed or mailed to you after phone call is completed. You schedule a time to try out a swim spa here in a showroom. Once the swim spa test soak is complete, a quote will be provided to you for specific models. The owner’s manual, warranty information and contractor checklists are also provided to help with planning. Yard visit scheduled – or we’ll have you submit photos of your yard for delivery examination and evaluation. Salesperson provides all details to you promptly after final approval from manager. You make the buying decision, call to place down payment order on swim spa or spa. To pay for your spa, taken advantage of our in house financing options, or you can pay with a check or card. How can I see or try a swim spa? The best way to see or try a swim spa is to visit our showroom.